On August 31, 1963, navy Lieutenant (jg.) 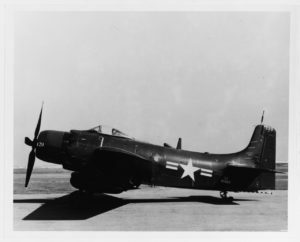 John L. Grunert, 25, was piloting a Douglas Skyraider aircraft over Narragansett Bay on a routine training flight when the aircraft developed engine trouble. Grunert was forced to ditch the plane in the water between the Quonset Point Naval Air Station and the southern tip of Jamestown. He escaped from the plane before it sank, and was rescued by a passing civilian boat. He suffered only minor injuries. Lieutenant (jg.) Grunert, a native of Florida, was attached to Early Warning Squadron 33, aboard the aircraft carrier U.S.S. Essex, which had arrived at Quonset Point the day before.